Canyon Vista Middle School students and staff raised a total of $5,185 for the Scleroderma Foundation as part of the campus’ “Canyon Vista Cares” initiative, which was celebrated with a student, faculty volleyball game. Canyon Vista staff chose the Scleroderma Foundation as its “Canyon Vista Cares” giving organization this year after hearing the sister of Assistant Principal Catherine Gutierrez is living with the disease. Scleroderma is a rare disease that causes the hardening and tightening of the skin and connective tissues, found more commonly in women. Gutierrez’s sister filmed a thank you message for students explaining her journey with the incurable disease. Student Council Officer Andrew Bailey helped organize the student, faculty volleyball game where the final fundraised amount was revealed. 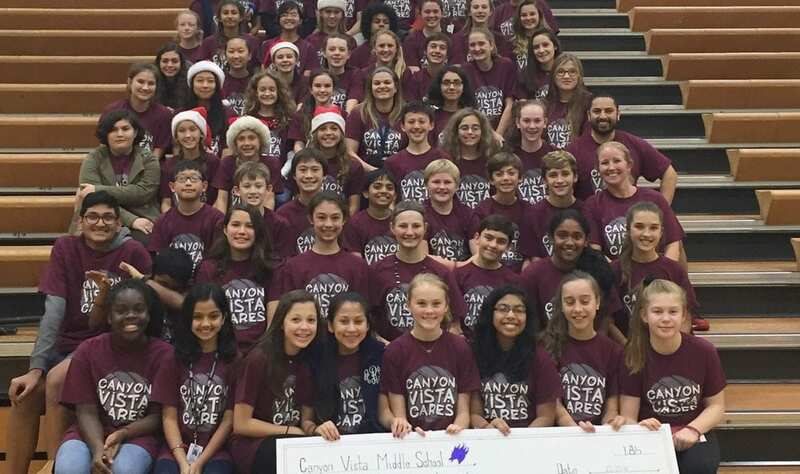 Funds were raised through the sale of “Canyon Vista Cares” t-shirts and wristbands.